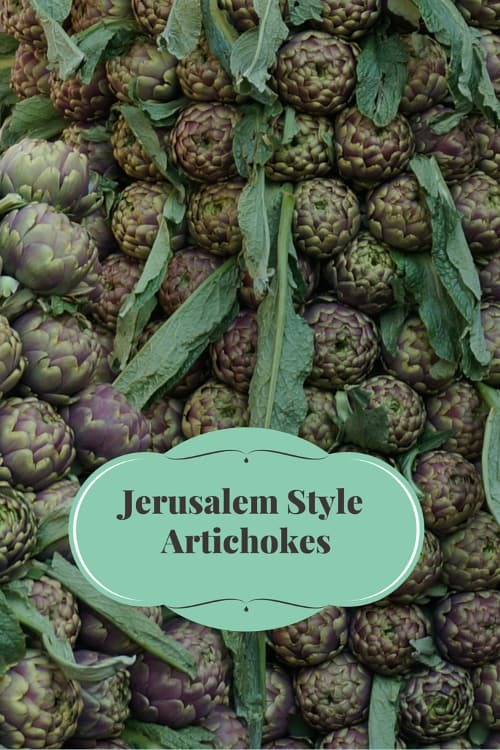 Jewish Style Artichokes are a staple in Roman cuisine when the favored choke is in season. Here’s a simple recipe to make them at home courtesy of Eating Italy. Like with most Italian cuisine, the number of ingredients is small, while the flavor is large. Cut off all hard or dark green base leaves with a small curved knife (called a “spilucchino” in Rome) until the bottom of the leaves are pale yellow in color. Tip: Start at the bottom of the ‘flower’ and cut at 45 degree angle all the way around, moving in an upwards spiral as you go. Cut the stem so that it is 10/12 centimeters in length and strip off the hard, dark green layer, leaving only the pale green stem beneath. Rub immediately with half a lemon, to oxidize (also rub lemon on your hands to prevent your nails from turning black!). 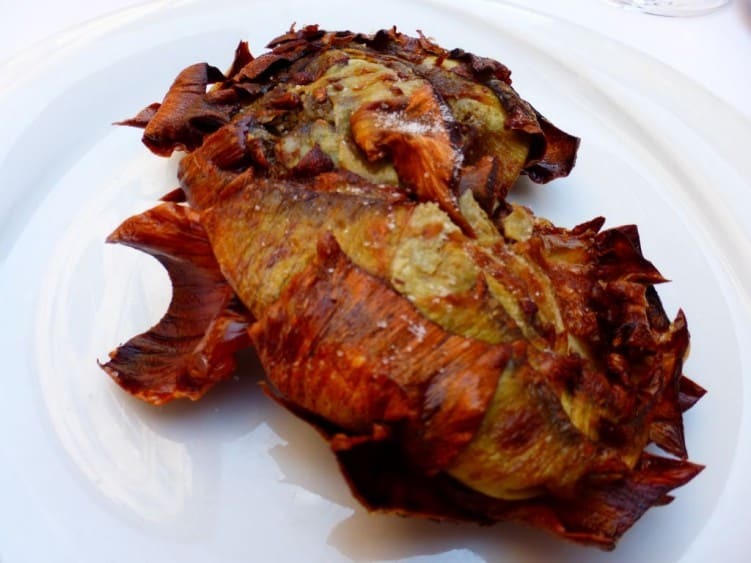 Place artichokes in a bowl with water and a little of the lemon juice. When you are ready to fry them, dry the artichokes off with paper towels and smash the heads down on a hard surface to open the leaves a little. Heat a large, deep pan filled with the oil (you know you have the right temperature when bubbles form upon inserting a toothpick into the oil) and submerge the artichokes. Cook over medium heat for 15 – 20 minutes, being careful not to let them burn. Turn over occasionally while cooking, to ensure even frying. When they are golden and tender take them out and let them drain on a paper towel. Don’t throw the oil away! You’ll need it for the second round of frying. Note: The first 3 stages can be done as early as the day before serving. Stages 7-9 should be done immediately prior to eating. When cool, gently open the leaves with your fingers and sprinkle liberally with salt and pepper — all over the inside and outside. Reheat oil and CAREFULLY place the artichokes back in the pan. Fry for a few minutes until golden brown all over. Take artichokes out, sprinkle with cold white wine (this creates a “thermal shock”) and immediately put them back in the pan of boiling oil for the final crisp-up. The leaves should open like a flower and be dark golden and crunchy. Thank you to Eating Italy and Cooking with Nonna for sharing this recipe.